Looking for bargains in pinball? Look no further, you’ve found the definitive list for top pinball machines under 1000. Now what this list won’t include is any EM games. You might ask “why?”. Well mainly because almost all EM games are under 1000 except for the very best games, meaning that you can pretty much afford any of them already. The newer digital machines, finding quality used games under 1000 is a lot harder, which is why I wrote this list to help. These machines are in no particular order in this list. The hardest thing will be finding them in general, as the production numbers means that there is a limited amount per city. Note that these will all be used pinball machines under 1000, none of these are new. In fact the newest game is like 25 years old, lol. Now here’s the list! Now I’m going to do a short overview of each game. Hopefully that will help give you a little more information on each game. Space Shuttle is a game that came out in the mid 80’s based around the super popular US Space Shuttle from NASA. It features a three ball multiball and some pretty fun gameplay. 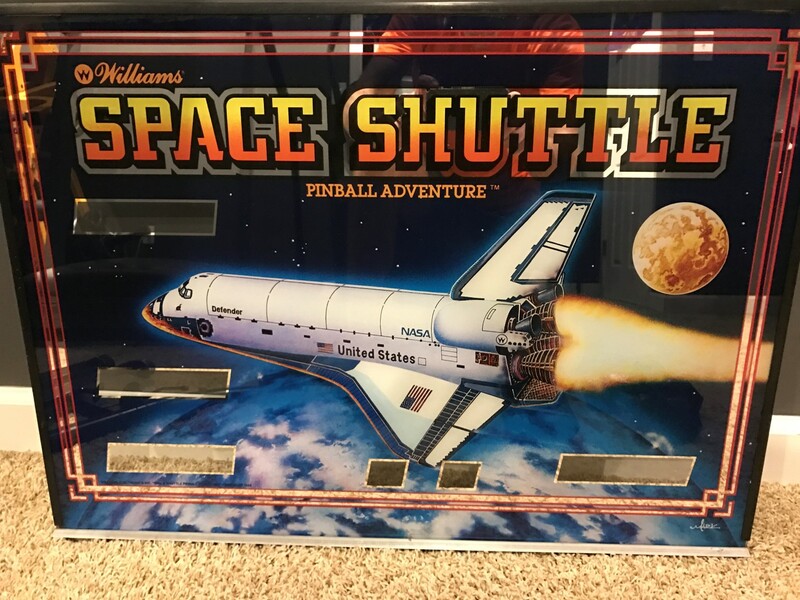 Space Shuttle, along with High Speed, are credited with turning around the pinball industry in the mid 80’s which was about to go under (as the whole arcade industry was in a slump at that time). It doesn’t have the best art package, but it is fun to play, and is especially good for new players. Another game with multiball, Firepower was a huge hit in the early 80’s. Not the prettiest game, it makes up for that with a challenging playfield that makes you work for multiball. It’s also one of the first games to have speech, so it’s sound package is a little more advanced than some of the earlier games of that era. I owned this game for quite a while, I really liked the challenge. Paragon is a classic Bally game from 1979. It’s famous for it’s killer art package and punishing gameplay. 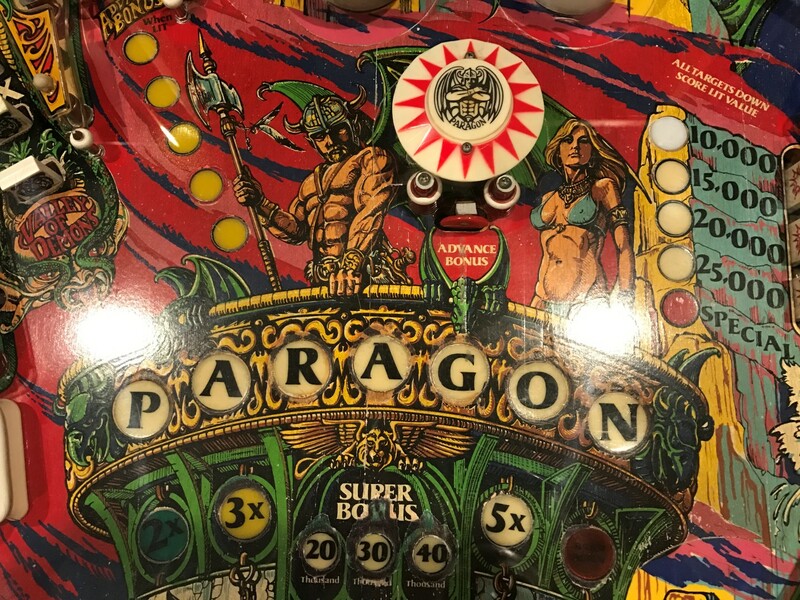 Paragon is definitely one of the harder games of that era, being slightly inaccurate will put you down the middle or over in the Beast Lair, a pop bumper over on the left hand side that can either save or drain your ball while you watch helplessly. I bought this game this year after wanting one for years, I always had a blast playing it at other people’s houses. Comet is a classic Williams machine that came out after Space Shuttle’s success. It was the first game to feature a million point shot, which continued the pinball trend of point inflation. It was made by designer Python Angelo, who would later come out with more amusement park games like Cyclone and Hurricane. It’s a very straight forward game, good for new players. The one bad thing is that it did tend to get played a lot. There are a lot of really worn games out there for sale. The most produced classic Stern, Meteor is regarded as one of the best games of that era. Luckily, its high production means that it also stays under the 1000 mark most of the time, unlike a lot of the other classic Sterns which are pretty rare for the most part. The biggest problem you’ll have when you find this game is that a lot of the time they’re not working. For some reason, this is a popular game to have sitting around not working. I don’t know how many of them I’ve seen over the years in various states of disarray. One of the under appreciated games of the era, I think the fact that the Globetrotters aren’t as popular today has led to this game sneaking under the radar for so long. Even though it isn’t a multiball game, it’s a challenging game with a big bonus opportunity and three spinners to rip. I wouldn’t mind owning one of these someday. I own NBA Fastbreak, another basketball game, and this would look pretty good beside it. Like most Bally games of the era, getting a big bonus is the key to scoring high. A DMD game under 1000? Yep, there’s really only one, Street Fighter II can sometimes be had for that price. It’s a combination of the fact that the art is awful, it’s a Gottlieb, and it’ not a great pinball theme. I honestly don’t think the game is that bad at all, but most people turn their nose up at it. The goal of the game is progress through beating all of the fighters. I think part of the problem is the game is a little linear in nature, but hey, a DMD for 1000 can’t be all bad, right? Hopefully this has helped give you some ideas of some good used cheaper machines that you could pick up for your home. If you like this article, I also wrote “Best Pinball Machines for Home Use” that you might want to check out.